Fife Gingerbread and Home Start in Leven both benefited from a generous donation of £1000 each from towns local brand new SPAR store. 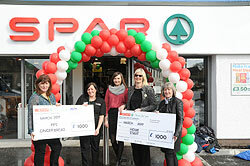 Owned and operated by Dundee based CJ Lang and Son Limited, SPAR Leven was able to donate funds raised through the sale of single use carrier bags by other SPAR stores in Fife region. 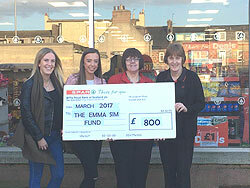 SPAR Peterhead, owned and operated by CJ Lang and Son Limited has recently donated a generous £800 to The Emma Sim Fund. 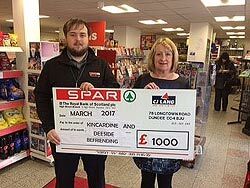 SPAR Stonehaven, owned and operated by CJ Lang and Son Limited has recently donated a generous £1,000 to Kincardine and Deeside Befriending. Congratulations to our SPAR retailers on their fantastic achievement of winning awards at this year’s Scottish Grocer Awards. SPAR Kirriemuir, owned and operated by CJ Lang and Son Limited has recently donated a generous £500 to Kirrie Connection charity.